No, no, I’m not a hunter. I’m just saying that it’s a bit more…. Look, I understand you have an opinion. And that lions are really cute. And you’ve posted a link to a petition to an airline to ask them to stop transporting trophies. Tell me, what happens if we rip away hunting when hunting protects more wildlife land in Africa than national parks? Ah, you’ve blocked me. Okay. I’m sorry. I mean it. I really am sorry that you couldn’t allow a tiny shade of grey into your world of black and white. And I really would have like to know what happens to that land when the industry goes. Last week I talked about how the internet can develop into a nasty maelstrom around people it deems scandalous and then destroy their lives. Today I want to talk about how it also damages conservation by, in much the same way as other media does, by reducing issues to pithy statements, devoid of nuance and heavily laden with emotion, and shaping the opinion of millions as it does so. Cecil the Lion reached millions, and it exploded all over my social media in a way few conservation stories do (even with my social media heavily biased towards conservation). But the story wasn’t really one about conservation. Although lip service was paid to the fact that lions are endangered and a lion was poached, the language of anger was the language of animals rights. The killing of Cecil was equated with murder, a moral crime rather than a symptom of a ecological problem. Throw in a dash of culture wars (a hatred of gun culture and rich white people doing expensive things) and you’ve got an animal rights story waging across the internet, only one that has a huge impact on conservation. And that is where the problem begins. I’ve written before at length about how conservation and animal rights, while often drawing on mutual a reverence of nature, are different beasts. Animal rights is concerned with individual animals, and their suffering and welfare. Conservation is concerned about protecting populations, species, habitats, ecosystems. It is entirely possible to be sympathetic to both points of view; indeed it is probably the rule. But when push comes to shove you have to pick a side, a focus, because some issues set one against the other. There is a reason we talk about wildlife and habitat conservation, not wildlife and habitat preservation. We have so fractured the world’s natural systems that we can almost never set aside a chunk of land, leave it alone, and expect it to retain all of its biodiversity without any management. This was one of the first, most shocking and most important lessons I learnt in my conservation masters – conservation requires active management. We can’t afford just to let nature be nature any more. Not if we want to hang on to what we have left. Take an example, Tembe Elephant Park in South Africa. A couple of years ago they reintroduced lions to the park, and the lions found the park to their liking, and bred like crazy. Now in the old days if there were too many lions in an area then the young ones would just wander off and find a new area. But they can’t, because the park is fenced. So now there are lots of lions, and they like buffalo, so now there are less buffalo. And because they are lions they don’t like other large predators, and so now there are less hyenas and leopards and the African Wild Dogs only hunt in a few areas not favoured by the lions. And since the lions like the big buffalo and not the smaller Nyala, the Nyala have increased in numbers. And increased Nyala have overgrazed the endangered Sand Forest ecosystem in the park, and reduced cover for the Suni means that tiny antelope has been declining…. In such a situation, inaction condemns a threatened ecosystem and a number of species dependent on it vulnerable to oblivion. Management is required, and several things have been tried. Lions from Tembe have founded new populations across Africa, reducing the pressure on Tembe’s other predators. Attempts have been made to fence off parts of the endangered forests. And culls of Nyala have been proposed. That conservation uses the death of the species it is trying to save is both paradoxical and not. Conservation is after all, focused on the health of species, and if the death of a few leads to the overall survival of the species, as far as conservation is concerned it’s a win. If that is hard to visualise, consider how many deaths evolution relies on to craft all life, including our own. But it is this lack of concern for the individual that has allowed conservation to, with varying degrees of enthusiasm, embrace some hunting. Most aren’t thrilled, but it protects a hell of a lot of land, and given the increasingly grim situation protecting habitat is a win. Given a choice of protecting the habitat exclusively for conservation and for hunting, we’d pick conservation. But that isn’t one of the options. Not at the moment, anyway. So we do the best we can with what we have. This is of course an anathema for many in the animal rights camp. And, honestly, that’s fine. To a point. I’m not unsympathetic to concerns about animal welfare, really. But, and this is a huge, enormous, but, if you are going to be an opponent, don’t dodge the problem of what that means. Ending trophy hunting in Africa would result in a massive change to the usage of a massive amount of land. A lot of money that is coming in will stop coming in. Businesses will go under and that land, well, it will have a lot of people looking at it. Now, sure, maybe some of it will get converted to tourism. But tourism can’t save all of it. I was in Africa earlier this year and the universal message I got was that bookings were down down DOWN because of ebola. Ebola, a disease ravaging the other side of the continent. Booking were down by half in some wildlife tourist sites. If tourists are too dim to tell Sierra Leone from Botswana or Tanzania, do we really want to rely on them to save Africa’s species? And don’t forget that Africa’s population continues to grow, putting more and more pressure on the land and many eyes watch the remaining wild spaces asking why the animals should have them and not hungry families. Reasonable people can disagree on the conservation impacts on hunting, on the benefits and costs, and on the morality and wisdom of using it as a conservation tool. The data paints a varied picture where the individual context of a location and species plays a bigger part in determining its sucsess than any overarching theory. But there has to be a conversation. If you cannot support hunting as a conservation tool you cannot simply refuse to hear any contrary arguments if you actually care conservation. The world is not black and white, it is grey. There are difficult, agonising choices, and as things get worse, and they will, those choices are only going to get worse. But that isn’t the conversation we’re having. The world has decided that hunting is bad, because that speaks to the heart instead of the mind, and if you try and tell them otherwise you are shouted at or blocked or brushed off. There is no nuance, no room for difficult decisions. And that really scares me. So here’s what I ask, all I ask for now. Don’t block out dissent, and live in a bubble. Because if you refuse to listen to other points of view because of your ideology, your opinion, you aren’t much better than a climate change denier. And that makes you part of the problem, not the solution. There was very little that you said that I disagreed with. It drives me nuts when people think that their opinion is the only correct opinion and get angry and antagonistic when you disagree with them. 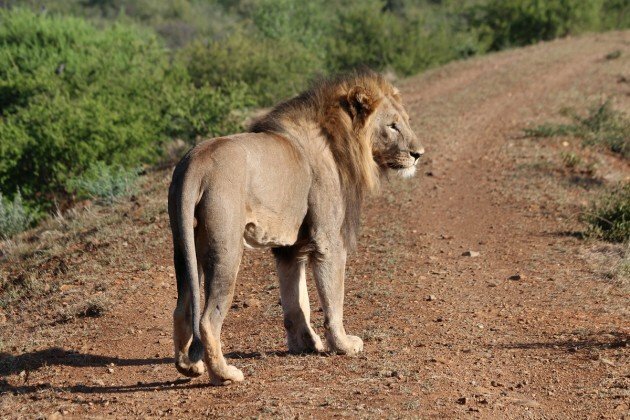 The aspect of this story that I found the most worrying was the use of a bow and arrow to shoot the lion. After wounding the animal they went off for some sleep then returned next day to despatch their quarry. Shows a complete disregard for the suffering caused, not something to be celebrated with a ‘trophy’.